For commercial use, a slip resistant tile is needed for where bare foot traffic will occur. (i.e. swimming pools and other leisure facilities). You will notice the 'pinhead effect' around pools etc. In your home, these requirements are not essential, it’s your choice what you use in your wetroom, with the addition of bathroom mats this helps the prevention of slipping. 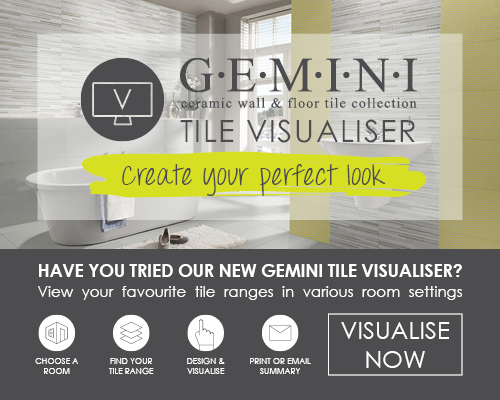 There are many different types of tiles available for different uses, with multiple finishes. if you're unsure, call into your nearest showroom where we will have ranges on display so you can really get a feel of what they would be like in your wetroom. Whatever the type of bathroom redesign you are going for we'd always recommend wall and floor panels and proper tanking preparation in all wet areas to maintain maximum water resistance. All wetrooms must be tanked unless the designated shower area is to be completely isolated within the bathroom by partitions – if water can get out of the shower tray, it should be tanked. If you like the idea of an open space but don’t want to go all out with the waterproofing you can then start thinking about taking elements of a wetroom to create your space centred around a walk in shower which comes with the added benefit of being easy to clean…What’s not to love! Imagine a minimal tray for easy access to your walk in shower – complete with an elegant glass screen which also means we can finally say goodbye to damp shower curtains! Wetrooms and step free access to showers are over taking the popularity of shower enclosures and traditional raised shower trays. They can look stylish and add value to your home. A recent survey by tepilo.com suggests homes with high quality shower systems are more likely to attract young professional buyers so will add great selling potential to your home. An integrated look will give you the illusion of space together with the benefits of open plan living. A luxury wetroom or walk in shower can be installed in even the smallest of spaces with level access shower trays – again with both offering an ease of access and step free entry. Level access shower trays with a low profile will give you an ultra-modern look and will provide an excellent walk in shower and both provide easier for access for both old and young. No clambering over the edge of a bath, it’s easier for children, the elderly and people with disabilities and just think how easy it will be when it comes to washing the dog! Now is the fun part to get started and get creative with your design. You can begin thinking of a zoned mosaic area to highlight the space and continue your chosen style or with a highlighted channel to house your shower fixings. With bold chrome shower fittings you can make a statement or you can try a concealed shower for the very minimal look. Mosaic strips are popular to house the shower head and build your shower and utilities into the wall to get a more minimalist feel or you could as an alternative banish a traditional plastic shower head and go the whole way with a wall or ceiling fixed circular shower head – giving you the rain down effect. Complete your new luxury space with under floor heating which keeps your feet warm. The warmth of underfloor heating is a terrific addition to your room, not only providing a heated surface it will also help to dry out the wet area as the heat helps the tiles to dry faster. Take it one step further and wave away steamed vanity cabinets with heated mirrors. Just because you're having a wetroom it doesn't necessarily mean you have to have the full room tiled in non-slip mosaics, perhaps just the floor areas with slipping hazards can be treated to the non-slip mosaic upgrade. Similarly when we think of mosaics we think decorative glass mosaics which obviously give a beautiful finish but wouldn't be very practical with wet feet so wouldn't be wise to have in a wetroom. Luckily many of our ranges feature a mosaic within the range in the same material and finish which is perfect when you’d like to keep all the colours blended seamlessly. We'd always recommend a non-decorative mosaic floor tile for anti-slip benefits. Similarly when you’re looking at borders and zones it still doesn’t necessarily have to be a decorative mosaic – again many of the ranges have a scored tile in the same colour-ways. Not wanting a traditional plastic bath panel? You can fix boards as your bath panel and tile it to create that ultimate chic look. Don’t just stick to showers! 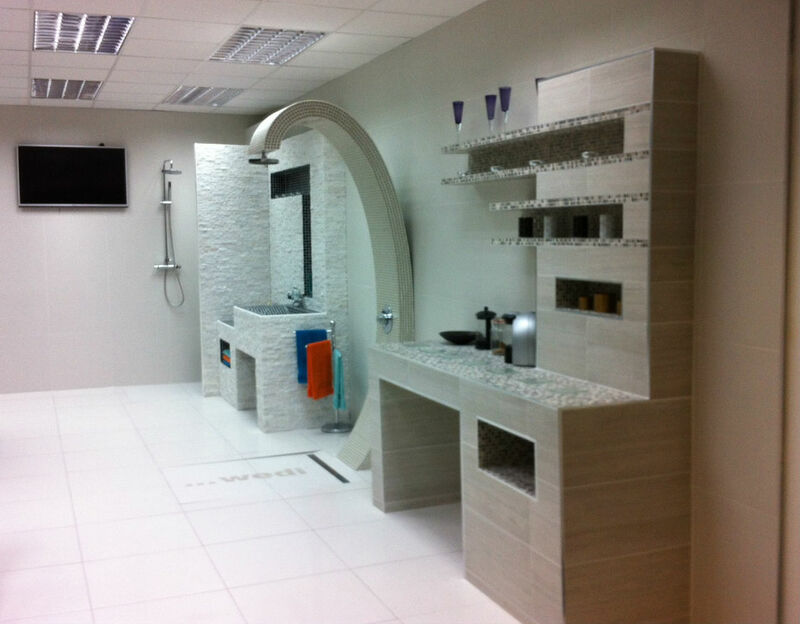 Creating a wetroom has never been easier with the materials available to build walls, benches and many more. 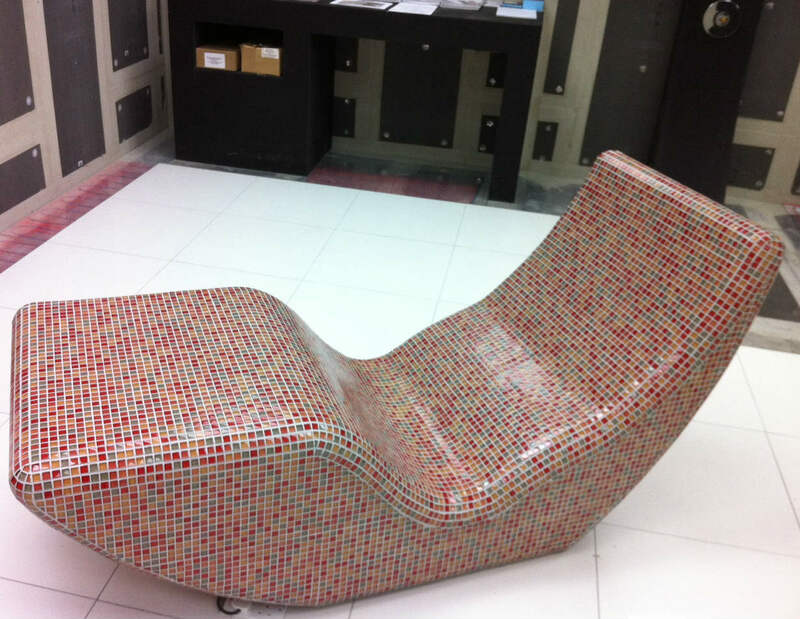 Take a look at this mosaic lounger! If you're tired of the white wash basins, bath tubs and showers; grab some exciting inspiration. Why not make a feature of your shower, or sink or bath…tile it! Try with no shower screen or section the area with a floating screen. There are many types of designs for shower trays available. Discrete versions with hidden drains compliment the minimalist look or drains on show in unique designs. You can let the imagination run wild with the layout of your room. Don’t worry if you think it’s all high maintenance. There’s ways to keep your grout sparkling with grout sealers and cleaners. A squirt of Lithofin mildew away could have your wetroom back to brand new. Excited about the possibilities? View all our wet room flooring options here.